Writer Dan Slott’s FANTASTIC FOUR #1 left a lot of people wanting more. Considering it promised to reunite Marvel’s first family and then didn’t was appropriately disappointing. So, does FANTASTIC FOUR #2 rectify this problem? Well, yes and no. 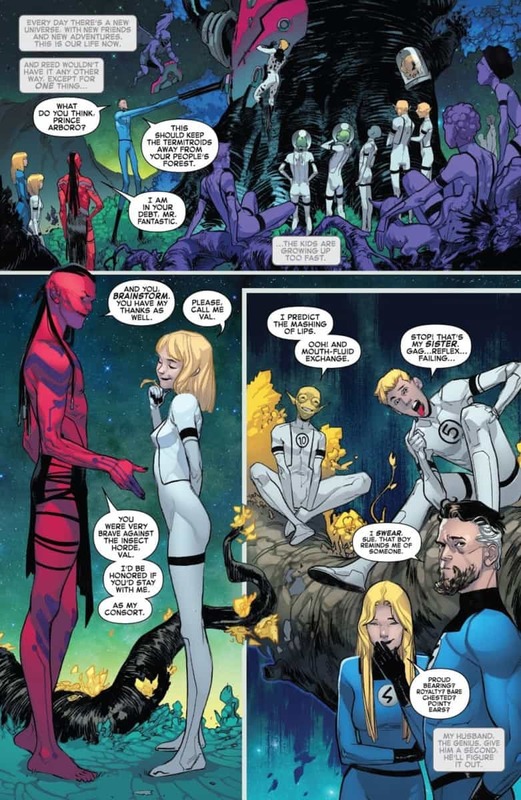 Dan Slott takes us to the stars in FANTASTIC FOUR #2 to show us where Reed, Sue, and the Future Foundation have been for the past few years. If you read Jonathan Hickman’s SECRET WARS, then you know they’ve been rebuilding the multiverse. FANTASTIC FOUR #2 gives us a closer look at that process, and how it’s apparently been a complete blast for the family and team. But, as their work finally concludes, a new enemy threatens all of what they’ve created. Joining Slott once again for this cosmic journey is artist Sara Pichelli, who delivers some explosively creative pages. As the family visits the many universes they create, Pichelli is there to capture it all in beautiful detail. She also depicts one of the creepiest Marvel villains in recent history. Following Hickman’s SECRET WARS, the Fantastic Four were basically finished. 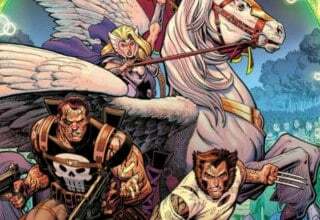 It seemed as though Johnny and Ben were dead (though they, of course, came back during the All-New, All-Different Marvel era), and the rest of the team were up in space rebuilding the multiverse. FANTASTIC FOUR #2 gives us a closer look at the latter. Franklin Richards, aka Powerhouse, has the power to conceive whole realities. With the help of the Molecule Man, those realities become real. So, this has been the process for about three years now. At least, to us, that’s what it’s been. It could have actually been longer for the Future Foundation in Marvel Universe time. FANTASTIC FOUR #2 page 3. 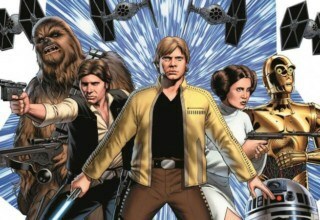 Courtesy of Marvel Entertainment. The team has undoubtedly visited millions of worlds. Where FANTASTIC FOUR #2 picks up, they’re on a world where, apparently, one of the rulers (who has an uncanny likeness to Namor) has grown fond of Valeria Richards, aka Brainstorm. She and Franklin have both appropriately grown up a bit, so it seems fair that this young prince is hitting on Valeria. As the team travels through the multiverse, they eventually find that Franklin’s powers “stop working.” I say stop because, though he’s still extraordinarily powerful, he can’t conceive universes anymore. This tells the team their work is done. But, right as this occurs, a new villain known as the Griever swoops in and starts destroying everything the Future Foundation has built. As things look dour, Reed goads the Griever into allowing them to call on the rest of the team to face her. In doing so, Reed doesn’t just call upon Ben and Johnny, but also anyone who’s ever been a member of the Fantastic Four. Which, come to think of it, is quite a lot of people. Comic book villains are often recycled again and again in a fairly repetitive cycle. Nowadays, it’s not that often creators will actually come up with new villains for the heroes to face. Dan Slott has gone against the grain, though, in FANTASTIC FOUR #2, as he sets the team against a very new and very dangerous threat. The Griever looks like something out of a nightmare. Even the way she is introduced is particularly haunting. It came absolutely out of nowhere. As the family is trying to figure out why Franklin can’t make universes anymore, the final panel of the page shows you the villain’s lips, as she smiles and cheers of her arrival. FANTASTIC FOUR #2 page 9. Courtesy of Marvel Entertainment. The best indicator of how dangerous the Griever is is a bit of a spoiler, so I can’t entirely share it with you. Trust me, though, because once you actually read FANTASTIC FOUR #2, you’ll fully understand how threatening this character is. She has these creatures/minions called Endlings with her that are just as creepy and off-putting as she is. They seem to consume raw energy. All-in-all, the Griever and her pets are strong enough to defeat some of the Future Foundation’s strongest members, including Franklin. Keep in mind, he’s boasted in this issue as having more power than Hulk, Silver Surfer, and Thor. The Griever mops the floor with him. And that bit’s not the spoiler. She does worse. In such a succinct amount of time, Slott introduced a very potent villain, who I’m very eager to see more of in the future. The art of FANTASTIC FOUR #2 is entirely fitting and appropriate. The issue features a wide range of locations and scenarios. Pichelli, along with colorist Marte Gracia, expertly captures every second of the action. To continue my discussion of the Griever, it’s like I said, she’s something out of a nightmare. Though it’s still too early to get a sense of what she’s after, it’s not to soon to say she looks insane, and she’s got the power to match the looks. This is the kind of creativity I usually expect from Pichelli, and she didn’t disappoint. The rest of the characters look great, as well. There’s some solid consistency at play, so nothing ever really feels out of place. FANTASTIC FOUR #2 page 5. Courtesy of Marvel Entertainment. The real treat of FANTASTIC FOUR #2 is the bevy of environments and worlds we get to see. 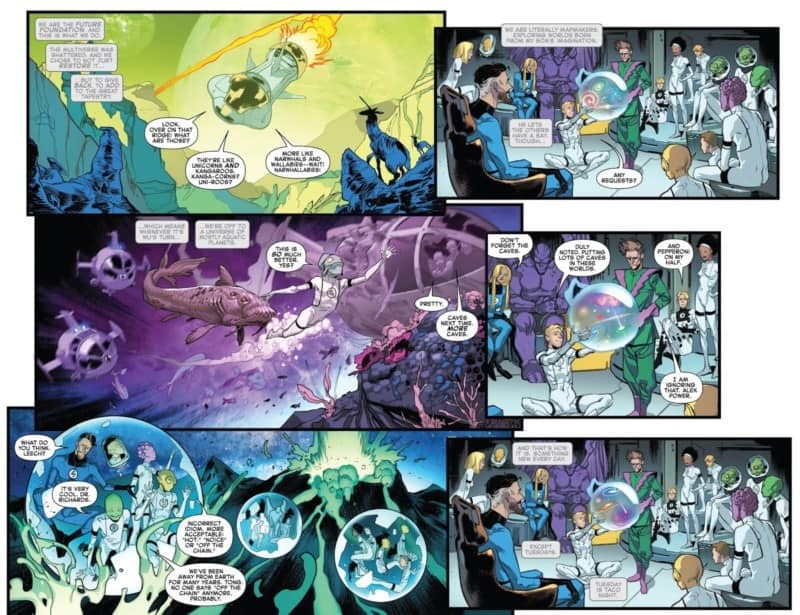 As part of rebuilding the universe, the members of the Future Foundation have some say in how Franklin and the Molecule Man make up the universes. This leads to some universes with more aquatic worlds and others that feature more worlds covered in snow. All of this is captured excellently. It’s actually all a very nice callback to Slott’s own SILVER SURFER series, where every issue took you somewhere new. Pichelli does a great job of capturing that same flair in FANTASTIC FOUR #2. As FANTASTIC FOUR #2 draws to a close, Slott does, in fact, deliver a family reunion. Although, it’s certainly not the one we were all probably expecting. FANTASTIC FOUR #3 promises to be an epic face-off between every FF member ever and the all-powerful Griever. That’ll be one heck of a light show. As for this issue, though it kept us waiting a bit longer, FANTASTIC FOUR #2 is a widely necessary tale. We needed this issue to fill in the three-years-long gap in the family’s history. Now that we’re all caught up, and we’ve got a new threat for the family to face, the timing feels even more appropriate for the team to finally reunite. Slott does a great job of telling this story and presenting us with a credibly dangerous villain. 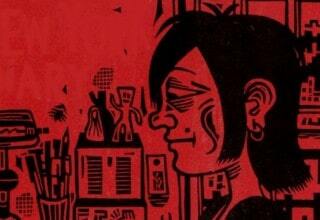 Pichelli and Gracia do an equally impressive job of capturing it all, making every page of this issue come to life. Whatever comes next for the Fantastic Four, I’m glad this is the team handling the action.